I can't see any liposomal china free vitamin c on your site. Please advise what's going on? This is only product in the world that gets me through my days. Both Ascorbic Acid and Sodium Ascorbate scientifically verified to be over 98% encapsulated in sunflower-based 150 nanometer liposomes. The highest quality vitamin C, manufactured in Scotland, UK. DSM Quali-C® is certified No GMOs and tested 100% corn free. The proprietary liposomal manufacturing process encapsulates an astounding 98% or more of the vitamin C.
Empirical only uses water that does not register any pesticides, ions of any type other than carbonate from carbon dioxide during even the most sensitive testing (the water has conductivity less than 0.07 uS/cm, pharmaceutical water is 1.3 uS/cm). 2% loss during Preliminary testing at 110 degrees. Soy Free: Liposomes are made from Sunflower-lecithin derived Phosphatidylcholine (PLC). Note: The sunflower is grown in Argentina. Empirical tests their raw materials for heavy metals and they are extremely pure. Great Taste: Natural fruit and berry extracts. No artificial flavors or sweeteners, no MSG, no alcohol. Ordering the World's Finest China-FREE Liposomal Vitamin C from INTELIGENT*Vitamin*C Inc supports the Vitamin C Foundation. China-FREE Liposomal Vitamin C is guaranteed not to contain vitamin C that is made in China. 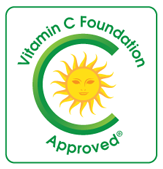 Vitamin C Foundation Approved® True-liposomes™ are a unique combination of the world's best liposomal technology and the world's best vitamin C.
Empirical Laboratories has mastered liposomal technology using natural phosphatidylcholine nanometer-sized liposomes as a delivery method for Vitamin C.
We believe that each and every component of our products must be as health building as possible. Current literature has shown that hydrogenated liposomes (trans fats) may have adverse health effects while natural non-hydrogenated phosphatidylcholine was shown not to adversely alter clinical health markers in primates. Our choice was easy. We are currently the only company to use all natural non-hydrogenated phosphatidylcholine for our delivery system with a claim put right on the label! Empirical has partnered with a local university to scientifically study their liposomes. No Soy. (Sunflower derived PLC). No "trans" fats, No GMOs. Natural fruit and berry extracts. No artificial flavors or sweeteners, no MSG, no alcohol. Liposomes are phospholipid particles that, much like a cell membrane, form a protective layer of fat around their water soluble contents, called the "payload." Liposomal technology was developed by the pharmaceutical industry and has been studied and perfected for the past 40 years as a means of delivering payloads (e.g. drugs) to the blood stream intact through the digestive tract. True-Liposomes™ are too small to be seen with an ordinary optical microscope. Exciting research in gene therapy is looking for ways to target liposomes at certain tissues or cells. Note the above video does not describe our process. We show it because it is a good depiction of what liposomes are. We believe it is necessary to emphasize that water is required in order for liposomes to form and be stable. There are major products claiming to be liposomal, yet they have no water!. Some products are sold as "micronized" meaning they have been ground to a millionth of a meter. These micron-size particles improve absorption into the blood stream and in theory are more bioavailable to our bodies than ordinary supplements. Liposomes are even tinier than micronized supplements - i.e., 1,000 times smaller! Forget microns, when we speak of liposomes, we are talking "nano-sized" (billionth of a meter) nutrient delivery systems. Liposomes and their lipid membranes protect their "payloads" from acids and digestive enzymes and may be able to enter the inside of our cells without expending energy (by merging with the cell membrane.) This may help explain the Levy Amplification effect against infection. Fortunately, most "liposomes" that are not manufactured commercially have been tested and they are emulsions, and not truly encapsulated liposomes. We say "fortunately" because of the following remarks by Emek Blair. Any impurity contained in the water inside a True-liposome™ might bypass the immune system. Here are my comments regarding these homemade .liposomes:. 1. Chemical stability: very acidic formula (vitamin C) + oxygen + lots of fats + a lot on energy from sonication + heat from sonicator + who knows what else is the lecithin + bpa and metal (e.g. chromium, iron, molybdenum) from using low quality water/low quality jewelry cleaner = chemical reactions such as hydrogenation, hydroxylation, destruction of vitamin C and a lot of toxic material. I think that using jewelry cleaning equipment is not the best idea to process food in as it is not even food grade (I would recommend much higher grade than food grade for making liposomes). 2. There are a lot of microbes, bacteria etc. in your kitchen, mixed in with cleaning chemicals, pollution in air, chemicals in tap water or bottled distilled water, impurities in the ingredients, and all the other chemicals that exist in the average house. Even if they were making liposomes, I would not want that brought into my bloodstream. If these homemade liposome do bypass your body's most important defense against food pathogens, toxins, and toxicants (your stomach) and get absorbed directly into your blood, then great care must be taken during processing. Our process uses water that will not register any pesticides, ions of any type other than carbonate from carbon dioxide during even the most sensitive testing (our water has conductivity less than 0.07 uS/cm, pharmaceutical water is 1.3 uS/cm). This same water is used to rinse away any cleaning agent and then we test for the cleaning agents in the waste water stream out of our 304l stainless steel processing equipment and holding tanks (we regularly passivate our stainless containers so that material will not come off of it during processing). There is always a positive pressure of NF or medical grade nitrogen so that absolutely no pollutants will enter the process. Note: The sonication and large dilution together will destroy the liposomes. Sonication for the homemade .liposomes. does something a little different. EASY CANCEL : Direct, online, email or phone.